Hello! I am Thundershot, tournament regular and moderator of both the Eternal subreddit and discord. For a while now there has been a card that only sees fringe play that whenever it gets used, all I see is laughter thrown at the user of this complex unit. 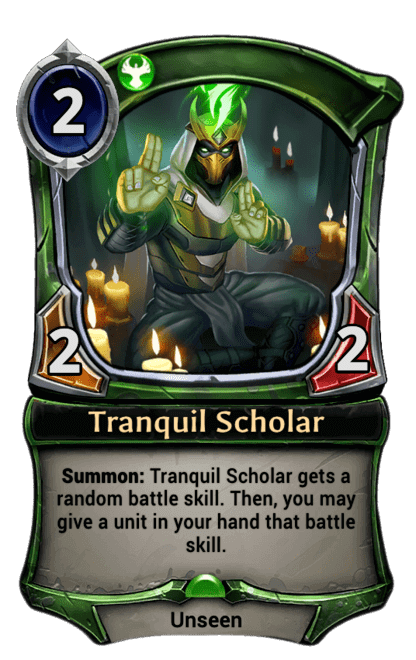 Hopefully by the end of this article, you will not be laughing anymore at Tranquil Scholar . I am going to break down this article into three parts; the first will be about how the card works mechanically, the second will be how to use it, and the third will be going over some decklists that use it. So many times when I see the card talked about, people think it works differently than how it actually works. Many weird things surround the card like sequence of events and these weird things called a "battle skill". Let’s start with battle skills. This word is on a very few cards, the most well known being hero of the people. Battle skills are basically keyworded abilities that affect the unit when it is on the battlefield and do not need special text to make work. Abilities that need special text usually are an abilities triggered by something such as entering the battlefield with summon, or dying with entomb. These cannot be given as they need more text besides the keyword to make function. The list of battle skills are deadly, endurance, overwhelm, quickdraw, revenge, aegis, flying, unblockable, warcry, double damage, killer, charge, lifesteal. It will not obtain battle skills it already has. For how the card works sequentially, it is simple though a little odd. The card when summoned goes through its animation as normal and gets a battle skill--let's say aegis. After that, you will be able to select a unit in your hand and give a copy of that keyword to it. This is very important as it allows you to avoid giving a unit a skill it already has and allows for more control over how you will use the ability. As a 2/2 for 2 its stats are slightly below curve on raw stats but that is ignoring the keyword it gets along with it giving a copy of that ability. The trick to using scholar is not to hope for a skill, it is to optimize the utilization of the skill. Scholar is a card that had the ability to swing games heavily in your favor if you optimize the keyword you get. Killer on Tavrod, Auric Broker or aegis Mystic Ascendant ascendant are clear examples but revenge Sandstorm Titan or overwhelm Awakened Student can be leveraged into very useful units in conjunction with the ability. I am going to do something few Eternal plays are brave enough to do, and that is mentioning Hearthstone(prepares for torrent of tomatoes). As many people are aware Hearthstone has many cards that utilize randomness. Due to this, players make strategies to minimize the bad and optimize the good. 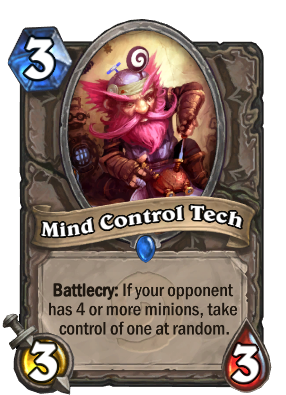 Let's look at the card mind control tech. In order to gain the most amount of value from its summon players usually remove things they do not want in an attempt to optimize their odds. While their prime target might be only a 25% chance it is better than the 20% chance it would be with 5 units. Even if the main target is not taken players usually are able to gain value from what they steal by either having multiple good targets or just using what they gain to pull ahead of their opponent. The most important thing is that they have a plan for each outcome and while they prefer some more than others, they can still work with what they get. Scholar works in a similar way. You do not want to play scholar in a deck with Icaria, the Liberator as the likelihood of getting a redundant battle skill goes up. Powerful units that either have no or only one battle skill work the best such as Predatory Carnosaur and Argenport Instigator . Since a unit will not gain any battle skills it already has, if you have multiple scholars and find that the ability you got is not good for the situation, you can give the skill to the remaining scholar in hand to make sure you do not roll it again. You should not do this all the time in an attempt to get that one or two keywords you really want. Instead, use this trick when the skill you rolled is terrible for the situation and anything else would be better. A good example of this is revenge against a Steward of the Past . The first is an Argenport Midrange deck(pre Bartholo nerf) I took to the finals of an open in October. The second is a Combrei Midrange deck lv13david took to all the way to a finals back in August. While both decks are out of date and not prepared for the current meta they allow us a nice insight into the types of decks that utilize scholar. Both decks have many one or no battle skill units like Valkyrie Enforcer, Combrei Healer, and Impending Doom, along with many of the other units I have been talking about throughout this article. Many of the units that do have a battle skill are usually the only one with it in the deck. This means that even if you roll endurance with a Tavrod, Auric Broker in hand you can still give it to something like an Impending Doom. The last thing I would like to say about these decks is that both of them run a lot of units. The Combrei Midrange deck runs over 30 of them; this assists with making sure that scholar always has a target. I hope you enjoyed this article. It was a lot of fun to write, and I hope you start to see this card as something more than a draft uncommon. I hope to write more articles for EternalWarcry on the future on a variety of topics. I would like to thank Stevercakes for allowing me to make this article and Ilya K for helping edit this article. I’d like to read recommended combos with this card? This article interestingly covered what NOT to combo with! ha. Nice article! I took out 2 Barts for Copperhall Bailiffs, but haven't played enough to see any difference. Three games in and I got an unblockable Tavrod for the win. It's not as difficult to pull off as people think!